The New York-based Forbes magazine had not deemed it fit to include an African south of the Sahara in its List of World’s Billionaires in its 100-year history until 2008 when the name of Nigeria’s Aliko Dangote appeared worth $3.3 billion. In 2011, Aliko’s fortune jumped to astronomical $13.8 billion, a–544 % increase in the history of wealth creation. Today, this African is the world’s richest black person worth $16.1 billion. How did he achieve this feat? What were the sources of his wealth? How did a -56-year old half orphan, who grew up in the arid dessert of Kano, northern Nigeria, invest a- $500 loan and turn it into the largest business conglomerate in Nigeria and West Africa in 36 years? The authors of this book were in Africa for 16 months to investigate the story of this billionaire. The book is purely an independent research and a seminal work by the authors, who managed to resist censorship during their field work, and succeeded in presenting readers Aliko Dangote’s secrets of success which aspiring business people can learn from in the life history of Aliko Dangote, especially on how to start small and grow big. 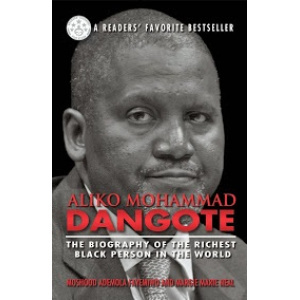 This is the first and only authoritatively-researched and comprehensively-investigated biography of Aliko Mohammad Dangote, the richest black person in the world. “This book is highly recommended to anyone who enjoys learning about how different people of all walks of life become rich and successful, and what it takes to get to the top.”—Readers Favorite Book (Starred Review), USA. MOSHOOD ADEMOLA FAYEMIWO was a newspaper publisher/editor in Nigeria where he grew up but now lives in Chicago. He earned B.A. Education/Social Science at the University of Lagos, Nigeria; M.A. Mass Communications (Journalism & Media Studies) from the University of South Florida, Tampa and M.S Information Science, M.A in History & Literary Studies from the State University of New York. His Doctorate is in Public Policy & Administration and he is author of Who’s Who of Africans in America and four published books. He is a member of several professional organizations: Association of American University Professors (AAUP); National Association of Black Journalists (NABJ); Society of Professional Journalists (SPJ); Investigative Reporters & Editors (IRE); American Association of Public Administrators etc. His forthcoming book is; Jonathan;The Squandering of Good Luck. MARGIE MARIE NEAL is former university professor, education consultant, and reading coach in Chicago. An alumna of State University of New York where she received B.S. in World History; M.S. in Reading from the Chicago State University, MSSED from American College of Education, and University of Illinois at Urbana-Champaign. Her Doctorate is in Education Organizational Leadership. She is co-author, “People Power in Africa:A Week That Changed Nigeria Forever“, and author of; “The Roles of Professional Organizations in the Effective Teaching of Reading in Chicago Public School-CPS: The IRA and IRC as Case Studies,” (forthcoming). She is president, Alternative Lifestyle Communication, DBA, Chicago. To be fair, how much do you think this Book worth? This 520 pages eBook have actually been selling for N5,000, but for a very short time, we are selling this eBook for just N1,000. Yes, you heard me right, JUST N1,000. But mind you, it is only for the first 50 serious minded people who desire to learn from great men and who don't hesitate to grab opportunities like this while they last. The Price will go back to N5,000 once we are able to sell to the first 50 future billionaires. PROCRASTINATION IS NOT ONLY THE THIEF OF TIME BUT ALSO THE THIEF OF WEALTH, BECAUSE TIME IS MONEY. Is Islam a "religion of peace"? Was Muhammad the true and final prophet of God? Is the Quran the fulfilment of the Bible, and legitimately continuing the traditions of the Judeo-Christian scriptures? 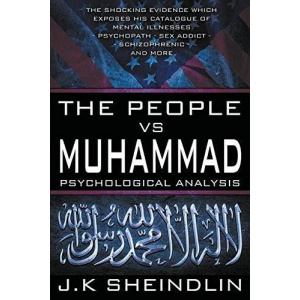 Perhaps one of the most audacious, shocking, unthinkable and highly controversial ideas to ever be conceived, The People vs Muhammad places the founding father of Islam on trial for crimes against humanity, and to challenge his self-proclaimed authority. With the growing threat of home-grown Muslim jihadist terrorist attacks and the ominous cataclysm of a global holy war, there's no doubt Islam has become a burdensome issue which has our own western governments perplexed. indoctrination, intellectual terrorism, censorship, grand larceny, racketeering, domestic violence, gender inequality, and much more! Volcanic gas inhalation, sensory deprivation, starvation, dehydration, brain damage and Syphilis. Written to provoke a rational response from both Muslim and western readers, the verdict is ultimately decided by the public to determine if Muhammad's claim to prophethood is legitimate.